A half-mile from the front entrance of Denver International Airport, two prairie dogs popped up from their dusty burrows. 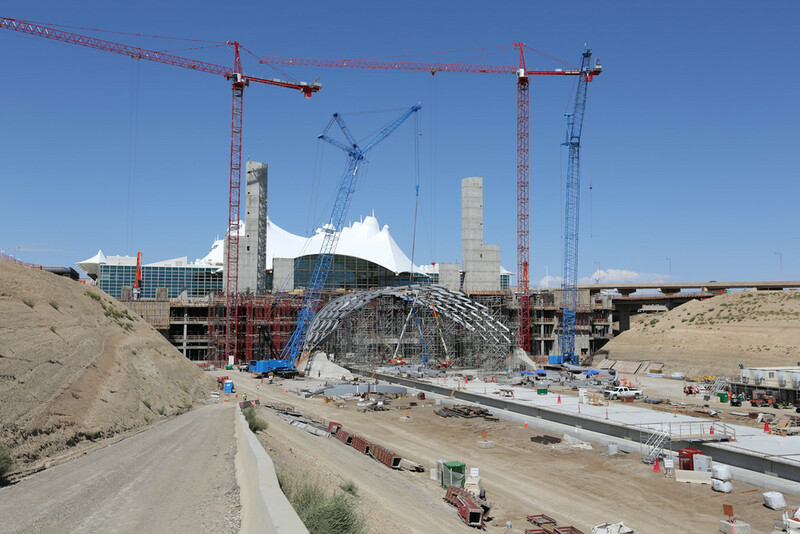 They saw concrete ties, rails, and construction equipment for the East Corridor Rail Line, a commuter train project that will provide a one-seat ride from Denver’s Union Station directly into the airport. “We’re building a basic, meat-and-potatoes rail line—with 15 minute headways so people get from the airport to downtown fast,” explained Kevin Flynn, a spokesman for Denver RTD. “The train will use standard equipment. It’ll include level-boarding platforms to minimize station dwell time. The multi-billion project is part of Denver’s “FasTracks” initiative, a sales tax imposed by voters in 2004. It is similar to Los Angeles’s 2008 “Measure R.” But unlike Measure R, FasTracks is entirely for public transportation expansion. All told, Denver, which has roughly one-fifth the population of Los Angeles, will build 122 miles of new train line. 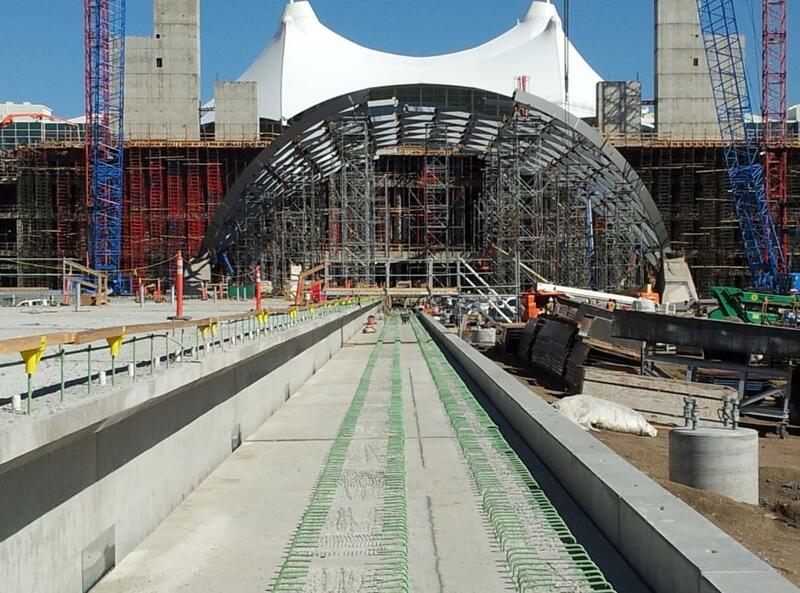 Los Angeles is building about 90 miles of new track. Denver’s new line will use Korean-built Electric Multiple Unit trains (EMU). EMUs, larger cousins of Light Rail (LRT), are powered by overhead wire, third-rail, or both, and are used all over the world for commuter, subway and surface systems, including airport trains such as London’s Heathrow Express. They are used in the Western US too; in LA’s subway and on Bay Area Rapid Transit. Currently, the closest Los Angeles has to an airport train is the Green Line LRT down the center of the Century Freeway. Its Aviation Station is 2.5 miles from LAX. The Crenshaw Light Rail project, currently in development, will get closer and might connect to the terminals, although it’s unclear when or how. If that happens, and Metro completes all its planned projects, it will take an hour to get to the airport from Union Station by rail, with 17 stops and a transfer at Exposition and Crenshaw. Meanwhile, anyone who knows LAX has probably noticed the old railway bridge over Century at Aviation, a mile east of the airport terminals. That is part of a County-owned ROW called the “Harbor Subdivision.” This freight spur runs directly to Union Station. The line could be brought into passenger service for a tiny fraction of what Metro spends on other projects. Using Denver’s meat-and-potatoes approach, it would take 20 minutes for a train to get from Union Station to LAX using this alignment. But it’s not going to happen; five miles of the Harbor Subdivision’s 15-mile route between LAX and Union Station will be torn out for the Crenshaw Line. And since LRT and mainline rail are incompatible, that kills the option for a direct, LAX-to-Union Station train on existing infrastructure. The Crenshaw line will cost $1.72 billion for 8.5 miles of transit. The Denver East Rail project, which includes new tracks, flyovers, stations and some new alignment, is 23 miles and will cost $1 billion. The airport train project required the cooperation of multiple cities, the airport authority, the Union Pacific Railroad, and other agencies. One complex portion, near Denver’s downtown core, required bypassing a freight yard and skirting a historic neighborhood. “But they found ways to work together,” explained Flynn. Meanwhile, outside Denver Airport, the prairie dogs dove into their burrows as a yellow machine tamped gravel between the cross-ties of the new tracks. Trains will whisk people to downtown Denver starting in 2016. The Crenshaw Line, still without a direct LAX connection, opens three years after that. B. It may take an hour to get to LAX from Union Station by rail in 2016, but as of 2013 it takes about half an hour by HOV-lane express bus. FlyAway connects Union Station with LAX 24-7 in 30 minutes. Taking the train to LAX from Union is either a technology fetish or an attempt to avoid FlyAway’s $7 fare. LAX rail is not about the LAUS-LAX connection, it’s about connecting the airport to other places in the city. Justin, thanks for your comment. But it’s not just about FRA regs. LA’s LRT standard is high-platform. LRT trains are about a foot narrower than EMUs or other mainline options. So if you attempt to run mainline trains on the same ROW as the Crenshaw Line, they will strike the platforms. As for the technological fetish, remember that Denver’s train isn’t only serving the airport. It’s part of a suburban line. The Harbor Sudvision actually runs all the way from San Pedro to LAX, through Inglewood, and then to Vernon and, via Redondo Junction, either LAUS or south to Orange County. I love Flyaway too, but that’s not really the point. If things had been planned better, we could be incorporating the entire South Bay into a fast, high-capacity airport-to-downtown line. And we’d get a proper gateway into our city, via a robust LAX train. Instead, we’re spending more money for less train. You could still build passenger rail on the Harbor Sub to accommodate LRT trains. Sprinter in Escondido did it– they have little ramps to extend the platform at each station. (It’s not ideal, and adds a bit to dwell time, but it can be done.) Or you could build off-line stations with LRT-compliant platforms. You might also have to make some changes to the pantograph systems on the LRT trains to accommodate for a larger loading gauge on the Harbor Sub. Or, you could haul generator cars, which kind of kills efficiency but it’s an option. Mainline trains can’t run on LRT tracks, but LRT trains could run on mainline tracks with a little ingenuity. My comment about the bus system, though, is that I think it’s techno-fetishism to demand all-rail-to-the-terminals transit. We have good transit connections to LAX. We could have better ones, if we invested a bit in bus lanes into and out of the airport. Transit in the area doesn’t appear to be at capacity. Just because it runs on rubber tires doesn’t mean it doesn’t work, or isn’t a “proper gateway” into the city. Not to mention that the Harbor Subdivision, in combination with the Crenshaw line and the Green line, and future extensions up Lincoln Blvd, could turn LAX into a secondary rail hub for the city, apart from Union Station. Ah! If things had been planned better! That seems to apply to a lot of situations in this world (and not just LA). It looks like we have two choices for the old Harbor Subdivision: A separate Union Station to LAX line, built to mainline RR loading gauge (like the South Shore line out of Chicago, or Metro North in New York) or a light-rail line using the standard LA cars (like the Blue Line, Gold Line, etc.). If we went to the larger EMU trains (and technically, light rail is a form of EMU), they could also be used on an electrified Metrolink San Bernardino line. One advantage of larger cars is that they work better for travelers with baggage. In July, I returned from Chicago to LAX (didn’t have time for Amtrak) and took Flyaway to Union Station. I went to the Gold Line platform for my ride to East Pasadena, where my wife would pick me up. I had to let two trains go by before one with enough floor space for me and my suitcase showed up. Regarding the idea of transferring from Expo to the Crenshaw line: If it’s a cross-platform transfer, well and good; if it requires changing levels, not so good for travelers. Some inaccuracies to clear up here. The Harbor Subdivision does not go to Union Station. It goes to the freight rail yards south of Downtown. You’d have to figure out a way to get it to Union Station at great expense. No way could this run in 20 minutes. You realize the airport in Denver is in the middle of nowhere. They can run 80 mph in the open prarie. The Harbor Sub ROW is in the middle of the city. You could do barely half that at best with all the crossings in the City. The minority community in South Los Angeles would be very opposed to having a train go through in which they would be denied access to stations and so forth. It would certainly garner lawsuits, racism charges and much more. This really isn’t a fair comparison. Denver’s airport is not surrounded on three sides by Inglewood, Westchester and El Segundo (with the Pacific Ocean as a fourth wall). I would love for LAX to have a direct rail connection, but it just isn’t happening without some major amounts of eminent domain. I used to be a fan of mixed service on rail lines, but there’s something to be said for letting subways be subways and commuter trains be commuter trains with their own levels of service, speed and frequency. Tokyo does mixed service, but their “commuter trains” are the same as their “metro rail” trains… electric with high platform boarding…. which, BTW really helps when you have luggage (which LAX passengers normally would). Thanks for your comment, Matt. Actually the Harbor Subdivision reaches Vernon, across the street from Redondo Junction. Amtrak and MetroLink already run from Redondo Junction to Union Station. It’s a bit of an obsession of mine and I’ve walked it and biked it many times myself. Up until the construction of the Alameda Corridor, which cut off the direct link, you could run a train straight across Redondo, through to Union Station–all on existing track. You can still do it, but you need to do a reversing move past where Amtrak/MetroLink’s flyover comes back down to the south of Redondo. Practically speaking, obviously, you’d need a single flyover track to re-establish the Harbor-Sub to Union Station link for passenger use–but that’s one bridge. And, yes, a train can get from LAX to Union Station on the Harbor Subdivision in 20 minutes–it would only have to average about 40 mph. That leaves time for interim stops (or you could have passing tracks for local stations) so I’m not sure why you feel this would have more blowback than, for example, Crenshaw, with all the charges of racism because it’s not fully grade separated. Airport transit is just not as important as people make it out to be. If you do it, the goal should be to serve people who *work* at the airport, not make a good impression on people who visit your city once every few years. (NYC transit to airports is a complete joke, but no one seems to think it’s really holding the city back that much.) Crenshaw Line will probably get more riders than Denver’s airport line. Rail from LAUS to LAX via the Harbor Sub would cost a considerable amount of money to implement, but not be terribly faster than LAX FlyAway, which, unlike rail, takes you right to your terminal. On top of all of that, Union Station isn’t a destination unto itself, it’s just a transfer point. Because of the location of LAUS relative to downtown, no one is really trying to go to LAUS, they’re trying to go somewhere else and just happen to go through there. Most people going to/coming from LAX are going/coming to somewhere else. Maybe 10% go to Downtown? And maybe only a handful is headed to Union Station area. Therein lies the problem with such a rail line. Ridership on a LAX Express will be exceeding low vs. a Green line extension north on Sepulveda or Lincoln. LAX Express using Harbor Subdivision is really a solution seeking a problem… We are better off building a fast and reliable transfer from the terminals to the light rail system – i.e. a peoplemover. Commuter rail or EMU, or even high speed rail makes sense to DEN or NRT because those airports in the middle of nowhere outside the urban metro area. LAX is inside the urban area… providing local train service to different parts of the urban metro area is a lot more logical service than a commuter rail to Union Station that is actually out of the way of the direction where most people want to travel. Interesting headlines, I did a write up of the Denver vs. LAX concern. I however disagree with the rant and think LA’s connector to LAX will do just fine. Thanks for your comment, Irwin. I’d like to point out again that the Denver train is not express, and my article isn’t suggesting an express-only service to LA-Union Station. That said, even the Narita Express shares tracks with Narita local services that serve the heavily populated areas between Central Tokyo and Narita, such as the city of Chiba. There are lines all over Japan where express trains overtake locals at designated points–when it comes to express and local trains, you can have both on one line, if they’re planned correctly. The closest example we have of that is CalTrain’s Baby Bullets. There are examples of airports that are within heavily urban areas that still have express services, such as London’s Heathrow. And there are too many airports in the world to note here that have suburban services that go from the main airport to the main railway station. LA Metro planning, unfortunately, looks at lines in isolation instead of figuring out their overall impact on the system. A train from LAX to Union Station isn’t just for people going to downtown–not by any means. A Harbor Subdivision Line would incorporate local stops, transfers to the Blue Line, and, of course, transfers to the focus of transit options at Union Station. Philadelphia is the model Rudick wants, and it gets 7,000 boardings a day… A total drop in the bucket with the number that fly out there. Annual ridership on the airport line is 2.2 million out of the 30 million passengers that use the airport… And note that many of the riders are airport employees. Quite frankly the numbers there make rail lines others are dubious of, like the Gold Line Foothill and Whittier extensions, look like home run investments. The LAX-Union Station line would duplicate existing bus and rail service, cause tremendous safety impacts to South Los Angeles (if grade separation is not added), and not be cost effective, as shown in the MTA’s Alternatives Analysis. Just some more info about the SkyRide from Denver’s RTD…which is similar to the FlyAway service by LAWA. Also, the terminal design is very different between the two airports. LAX is definitely a child of the era it was born to…as is DIA. Were LAX to try to transition to a more DIA like terminal design, running direct service would make more sense. Most rail lines to airports are used mainly by airport employees. This is nothing to sneeze at, of course. The important thing to remember about extremely frequent shuttle buses — like the ones running around LAX — is that they’re extremely inefficient, expensive, and polluting to operate compared to rail. There’s a reason most big, multi-terminal airports have been switching to rail-based “peoplemovers”. Hooking an airport peoplemover into the Crenshaw line and Green line and retaining Flyaway service seems apporpriate, though. I can believe that. I think overall that’s about the same percentage that ride the Red Line for the first 10 years (albeit, Portland’s Red Line opened on September 10th of 2001, making it unusable for months). After that it was almost 8 years before the development around the stops going to the airport were able to take off too, now that they have the number of riders is going up dramatically. Rail from LAUS to LAX is a different question than rail within the terminals. A peoplemover connecting the terminals to external parking lots, the (currently pathetic) city bus terminal, and a Crenshaw line station would be fantastic. Meh. The Harbor Subdivision from Crenshaw going east should and probably will be converted into an “active transportation corridor” with a bike/walking/jogging path and greenery in place of the tracks, something desperately needed in that part of town. Hopefully, it will also include other changes to enhance transit and walkability and reuse of the older industrial facilities along the way. The best hope for the Crenshaw light rail connection is that it connects with an intermodal terminal/people mover a bit east of the Airport that will enable people to conveniently transfer from local buses, rail lines, rental cars, long-term parking lots, etc., including checking in and checking their bags (even if only electronically) and clearing security, and be taken straight to their terminal. Assuming this new facility is modern and capable of handling a lot of traffic efficiently, it would divert enough of the traffic from the interior road network inside the airport to greatly alleviate the traffic problem and provide everyone travelling on every mode an enhanced experience. You’re giving a total windshield perspective, because you write as if transit is only about reducing traffic, not about being useful in its own right. A mainline track from LAUS to LAX would enable the entire 400-mile Metrolink system to tie into the airport directly. Amtrak could use it too to access the airport. And a simple transfer from the subway would give you a reliable trip time to the airport (Flyaway’s nice, but it’s still stuck in traffic for much of the ride). Considering we already had the mainline ROW, tearing it up for a few miles of piddly LRT is a travesty. The people-mover/Crenshaw line is typical LA, Rube Goldberg planning, where it’s all about politics, not transit. Like many LA Metro studies, the 2009 study you’re linking to was done to support a political objective (mainly, justify the Crenshaw Line to make the LA supervisor happy). In the height of absurdity, it split mainline rail into EMU, DMU and Commuter Rail. That’s about as silly as splitting train types into different colors. What it proved is if you build mainline rail that can carry both EMU and Commuter rail, with express and local service, it blows away ridership on LRT. 1) The line to Denver’s airport also goes through many neighborhoods to get into downtown. And lots of airports in the world are on the ocean but still have a one-seat ride train to downtown. 2) Why would you need eminent domain if Metro already owns an ROW all the way from LAX to LAUS? You don’t. 3) Your other point seems to be that Tokyo does great things to make transit seamless…So we should not follow that example? You’ve lost me. Exactly. And that secondary rail hub will need tied into the mainline network, meaning Amtrak, Metrolink and High Speed Rail. That’s why you need a mainline connection too–but Metro is dismantling the ROW that already exists to connect it. That is myopic madness. Portland has one of the best airport connections in the nation. You get off the plane. Get your suitcase. Get on the train. It takes you directly downtown, where you can either stay on your train to continue to Beaverton or transfer easily to go anywhere in the MAX system. No people mover BS/forced transfers. No leaving time for traffic delays as one must do with Flyaway. No standing in the airport loop after a long flight, choking down fumes, wondering when the Flyaway will actually arrive and then having to waste 20 minutes while it lumbers around the traffic jam in the loop. Bring the Green Line straight up the horseshoe to the Bradley Terminal–that would be the equivalent of what they’ve done in Portland. Then just use LRT equipment for that too. As it is, the Regional Connector is also under construction. When it’s completed, Metro could certainly route trains from the Crenshaw Line through to LAUS. Yea, I completely agree. The inability to transfer behind security is outrageous. Quite honestly, they should just completely close the upper level to drop-off traffic and use it for a train. That way, it could operate as the inter-terminal transfer without the need to construct a completely new system as well as deliver people directly to the Crenshaw Line. Security could just be at the Crenshaw Line/car rentals plaza and people who still want to get dropped off closer to the gate can do so in the current structure. That makes far more sense than the proposal to have a “people mover” that goes to the center anyway. There will be no physical connection between the Expo tracks and Crenshaw. Just a forced transfer. So, no, you can’t do what you suggest. Well that’s a rather large problem. Sure you would, since the western end of the right of way has been used for the Crenshaw Line, and the eastern portion on the line, along Slauson, would require “temporary” construction easements that, due to construction along the edge of right of way, may require property demolition. Since you are doing so in a minority community, serving a population that is less minority than that, you fall under Title VI of the Civil Rights Act, and the only way to mitigate that is to put stations for this service in the community, which will remove or eliminate the express nature of the Airport-Union Station service. The local elected officials on the Harbor Subdivision are supporting an active transportation corridor instead, and I fully agree that an active transportation corridor has a better impact immediately for the residents in the area and greater possibility of pollution reduction (eliminating short trips from less-maintained and older vehicles driven by working class residents), as opposed to catering to higher class individuals who are allergic to the existing Flyaway bus for some unknown reason. Because the Crenshaw Line, in the unfunded strategic plan, will go to Hollywood to connect with the Red Line, all east-west buses that serve the Westside, and the Miracle Mile area. There are more residents and businesses in that corridor than if the Crenshaw Line continued east. The terminals on the south side of the airport are now all connected airside. The ones on the north should be as well, but walking transfers can be done much cheaper than requiring construction of an APM. Fair enough, but it seems like making a corner that would allow the trains to turn to either go east or continue north would be a rounding error in the grand scheme of things.